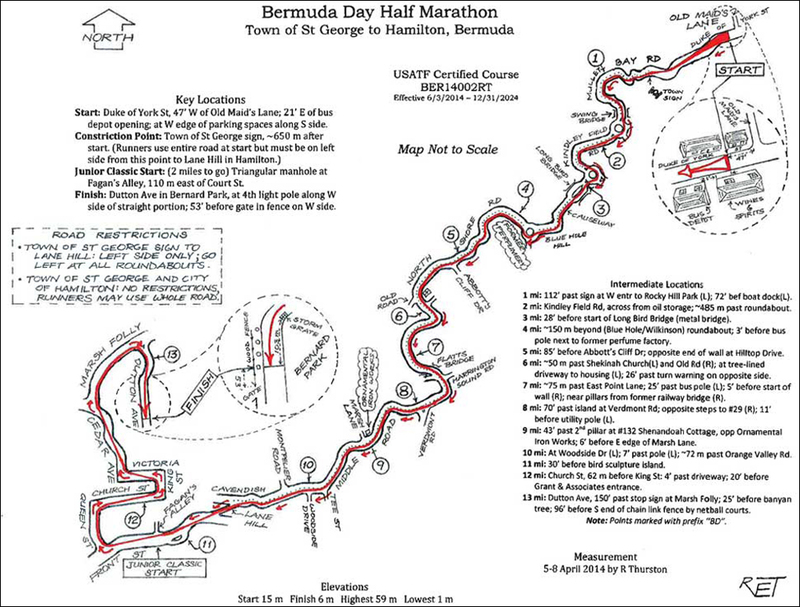 The upcoming Bermuda Day Half Marathon will see participants race from St. George’s to Hamilton, with crowds sure to be lining the route to cheer them on as is always traditional. The listing on the event website said, “The race starts at the junction of Duke of York Street and Old Maid’s Lane, St. George’s. Runners may use the entire road from the start to the Town of St. George’s sign. From this point participants must run on the left side of the road including following the normal traffic flow at all roundabouts until Lane Hill in Hamilton. “Proceed along Mullet Bay Road, Kindley Field Road, The Causeway, Blue Hole Hill, North Shore Road, Flatts Hill, and Middle Road. Turn left at Lane Hill. Proceed down Lane Hill to East Broadway, and Front Street to Queen Street. Proceed up Queen Street turning right onto Church Street to King Street. Turn left at King Street and proceed to Victoria Street. “Please do not park on private property or block private driveways. Do not park on roadways with a yellow line; your vehicle will be ticketed by the police. “There are nine official refreshment stations on the course. They will provide fresh water and a sports drink for all participants. “Refreshments will be provided at Town Square in St. George’s before the start of the race. Does anyone know what time the marathon and parade starts?